African Confederation Cup giant-killers Royal Leopards from Swaziland claimed another victim when they defeated Congolese side AS Vita Club 1-0 in a last-16, first-leg clash. The victory for the police team follows shock successes against South Africans Wits and Angolans Petro Atletico in previous qualifying rounds. AS Vita coach Florent Ibenge came to Somhlolo Stadium promising to "finish the job" within 90 minutes and render the return match academic. But Leopards thought differently and a late first-half goal from Mthunzi Mkhonto gave the locals a third triumph in five African Confederation Cup games this season. Mkhonto has been a Swazi football hero for several weeks having scored the tie-clinching round-of-32 goal against Petro in Luanda. Leopard coach Sifiso Ntibane dedicated the victory over the Congolese - the 2014 African Champions League runners-up - to King Mswati III of Swaziland, who turned 47 on Sunday. "Our victory is dedicated to the King and will serve as a gift from the team on his special day," Ntibane told Swazi media. The overall winners advance to play-offs against the African Champions League last-16 losers and Leopards are hoping to become the first Swazi side to reach that stage. Former African champions AS Vita Club are among the favourites to win the second-tier Confederation Cup and collect the $660,000 (610,000 euros) first prize. Elsewhere, South African visitors Orlando Pirates conceded two goals before hitting back to force a 2-2 draw against Gabonese Mounana. A first-half goal by Burkinabe Bassirou Ouedraogo gave the hosts a 1-0 half-time lead in the first leg in Libreville. Former African champions Pirates were lucky to trail by only one goal at the break as goalkeeper Brighton Mhlongo made several superb saves and Mounana were foiled by the woodwork. Leading Confederation Cup scorer this season Georges Ambourouet raised his tally to six goals by doubling the lead eight minutes into the second half via a penalty. But Pirates demonstrated their fighting spirit and scored twice within 10 minutes through substitutes Lehlohonolo Majoro and Thabo Rakhale. Nigeria striker Gbolahan Salami bagged a brace as Warri Wolves built a 2-1 lead over Congolese visitors FC MK Etancheite. The efforts of Salami were partly undone five minutes from time when Mombo Lwamba got one back for the Kinshasa outfit, who missed a first-half penalty. Warri are the only Nigerian survivors in the two African club competitions this season, and they will travel to the heart of central Africa knowing how strong their opponents are at home. Etancheite also lost 2-1 away in a round-of-32 tie, but then slammed five goals past Sudanese Al Ahly Shendy at Stade Tata Raphael in the Congolese capital. In other games, Nadir Haroub gave Tanzanians Young Africans the perfect start against Tunisians Etoile du Sahel by converting a second-minute penalty, but they had to settle for a 1-1 draw in Dar es Salaam. 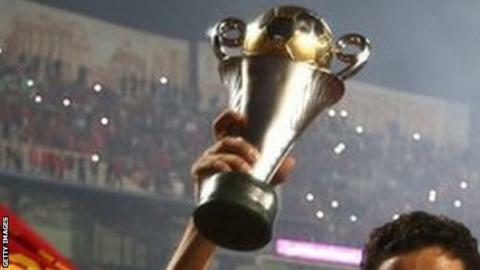 Mohamed Amine Ben Amor levelled a minute into the second half, making 2006 Confederation Cup winners Etoile favourites to advance after return match in early May. Ghanaians Hearts of Oak won 2-1 at Malians Djoliba and Tunisians Club Africain drew 1-1 at Algerians ASO Chlef in other first legs.